Now, you might be thinking that this company might be expensive by few margins. But, you might want to increase the number of margins by more than just few. Even its basic package, which is just PPTP costs $7 per month. This came out as a big surprise because when it said basic package, we were not expecting the most basic PPTP only. We do not have to waste our breath in telling you how much PPTP is not secured enough, do we? Now, if you were planning to use it to access some geo-restricted content then this would have been enough, but $7 is just too much for this. 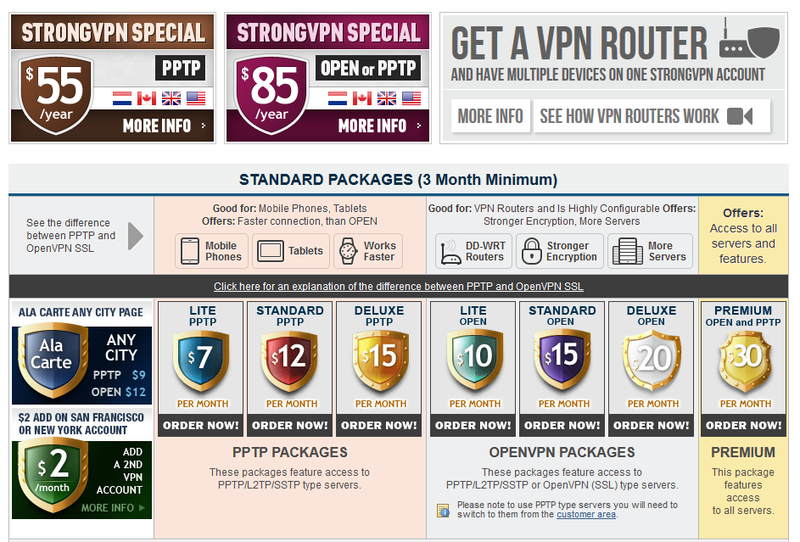 Now, let’s have a look at how much StrongVPN charges for OpenVPN. Needless to say, OpenVPN is perfect if you need a lot of good privacy levels. 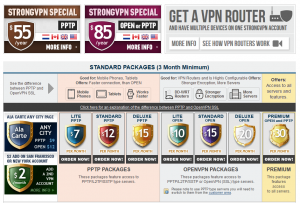 The StrongVPN provides this service in different packages. And, the lowest level package will cost you $10 per month. If you want to spend more amount of money then you can get a package in $30 per month. Here we would like to inform that many company provide their high level packages in just $10 per month and it seems that StrongVPN provide their lowest level package in the same price. Shocking!!! At $20 per month you can choose the ‘Deluxe’ OpenVPN package that provides access to servers that are outside the United States of America. It pretty much provides access to servers in around 19 countries like Singapore and Turkey. You will have to pull out money for at least 3 month. This is applicable for all VPN packages. So, through this equation you will have to pay $60 right from the start to use the cheapest service of StrongVPN. But, the plus side is that this company offers a guarantee through which you will receive your money back in 7 days if you do not like their service. The shocking news does not end with the price of the VPN services. You will be even more shocked when you see the whole pricing structure. There is pretty much no difference between the various plans. It is like the plans are there just for the namesake only. There is no major difference between the Premium and Deluxe plans, and other plans as well. Both the former two plans offers are access to the international servers and the allowance of number of server switches. If the number of server switches that you want is more than mentioned in the plan they you will have to pull out some extra money. Let us inform you that other companies offer unlimited number of server switches. For $5 per month, StrongVPN provides a DNS package. This sure is way cheaper than the basic aka PPTP package. So, if you just want to have access to geo-restricted content, then you are better off with this package. You can also buy configured and pre flashed DDWRT routers from the StrongVPN directly. With this you can pretty much connect all the devices that use internet with one VPN connection. Since the router provides you extra something, you will have to pay extra money as well. For example, you can buy a Belkin Share N300 from Amazon in around $27, but the same version of router that is configured and pre flashed will cost you $99+$85 (VPN subscription for a year), if you buy it from StrongVPN. Now, it would come out as no surprise if we say that only one device can be connected at a time. Despite all the negative things, StrongVPN has one positive thing and that is it provides a large number of mirror sites. This information has be made available from the China. One look at the StrongVPN’s website and you are bound to be impressed by its look, appearance and graphics. It’s easy navigation and informative contents will make it easy for users to understand what VPN is and why anyone would need it. Since, the company wants to target international companies as well; it has provided most of the information in Chinese, English, Russian and Spanish. The website also contains FAQ, and blog and forum sections. However, if you have technical questions then the FAQ will not be of much help and you will have to be in contact with the customer service. There are few things that we really found sore about the website. The website continuously tries to push people towards the PPTP services. 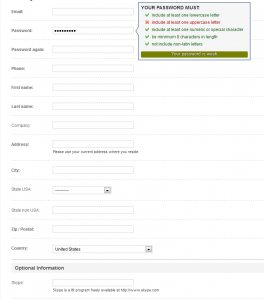 As mentioned above if you want to have various kinds of access then say “NO” to PPTP services. Another thing that we would like to point towards is the reporting of Firefox where 99+ tracking objects were blocked in the landing page alone. The website’s best point is its customer support. The live support provided in the website replied to our queries quickly and it seems that they have staffs that are skilled in various languages and are pretty much available most of the time. We also found that we could give reviews about staff members as well. (It was pretty fun). The only sad thing is that when we asked some really tough technical questions, we had to wait till they called an expert who then gave us half or no answers at all. If you do not know how to install VPN then have no worry because a staff member will easily log into your computer through Team Viewer and then install the VPN in your computer. 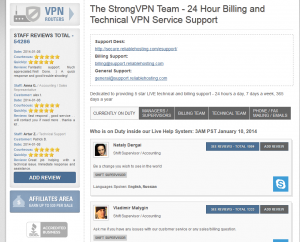 It really seems that StrongVPN is very keen about their customer service because customer support is made available to customers through Email, Skype and in US’s case even in voicemail. ‘During our normal course of duties, we do not monitor, record or store logs for any single customers VPN activity. We do not store web traffic data, including websites visited, files downloaded, etc. People would rather prefer if there were no logs regarding their internet activity. The contrast of the above statement can be clearly seen as StrongVPN has been well known for being very strict when it comes to filesharing. If you are found that you are doing something agains copyright infringement then you will receive a first warning and then the service will be disconnected. It will take action after receiving a DMCA notice. You obviously cannot determine the encryption that you would be currently using nor would you be able to choose the encryption level. The whole issue becomes even more complex and confusing since various servers use everything from 128 bit Blowfish encryption to 256-bit AES. 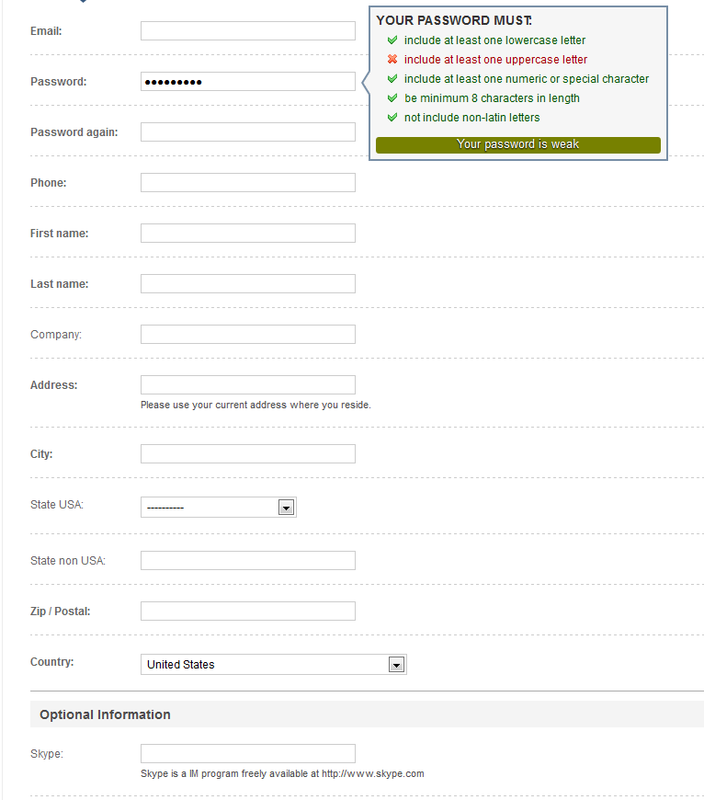 The process for signing up is not very confusing, but you will have to provide a lot of personal information for that. Payments via western union, credit card, check and wire transfer are available. However, the requirement for a large amount of personal information pretty much kills the use of Bitcoins. It also accepts PayPal. We tried to use the PayPal and after authorizing the request from PayPal, we received the details and information regarding account and setup. 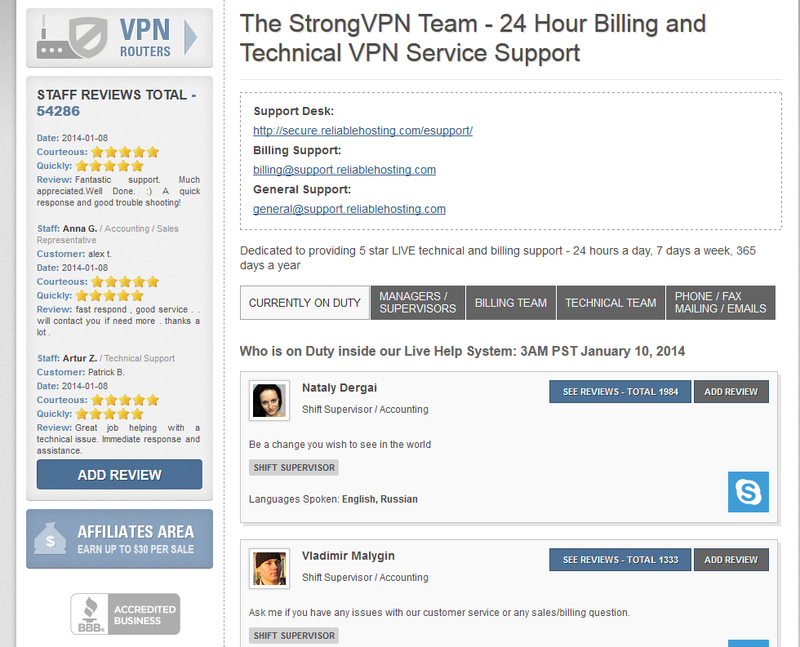 A separate dedicated VPN client is offered by StrongVPN for OSX and Windows. The cost surely does not match the number of times the server can be switched. Other VPN service provider allows unlimited server switch. But, StrongVPN has a limit regarding the switch, which is simply very unfair. The options page can be easily accessed from the ‘StrongVPN Taskbar’ icon. However, the page does not deal will practical configurable things that are useful for users like port forwarding, internet kill switch etc. Rather it deals with some issues related with technical configuration. There are two types of offer for Mac. The first one is to use the StrongVPN’s client and the second one is to use Viscocity’s licensed copy (free of cost). The setup guides for this is provided by Linux and Android. For an iOS you will need a jailbroken device and then you can set the software by using GuizmOVPN. 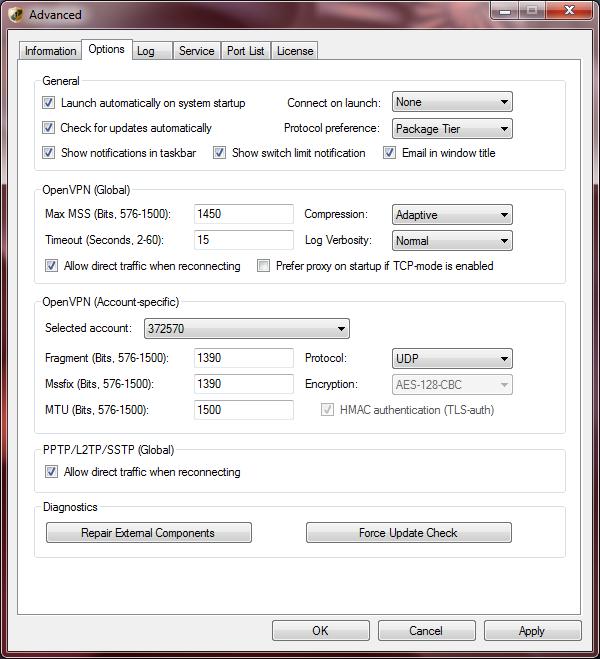 Even the Windows users can use the generic OpenVPN rather than the StrongVPN’s software. We then tried to test the performance of StrongVPN by using our broadband connection of 20GB (UDP OpenVPN). We found that the speed was comparatively very good. However, the result from Netherland was somewhat disappointing, but the results from other European countries were pretty much consistent. Since the results were of same range, we can conclude that the consistency is not that bad. However, there are some rooms where StrongVPN can make some improvement. All Rights Reserved. Copyright by VPNhive.com © 2019.